The Wake: How the practice of showing up to a place to look at the recently departed begin? While there is no definitive data saying wakes started at this time and place, wakes have been recorded as far back as Roman times. After the remains were anointed, and the decedent laid out with their feet pointing toward the door, the family would gather at the bedside. Before modern medical technology, there was a real (and very legitimate) fear of being buried alive. Hence, family members and friends would hold a vigil for a prescribed amount of time to make the decedent was actually dead. 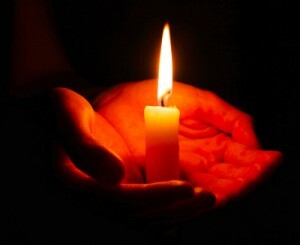 The Hebrew tradition of shemira is related to ancient tradition of the vigil. In the Jewish custom, a shomer (shomeret if female) guards the body until it is buried. This fear of premature burial was so pervasive that the president of the Second Continental Congress, Henry Laurens, of South Carolina, ordered his body burned because he was terrified of being burial alive after his daughter almost met with that fate. This is the first recorded “cremation” in America. (I put quotations around cremation because it wasn’t a modern cremation in a retort, it was more akin to an open-air pyre). The Colonial and Victorian fears of premature burial spawned a whole cottage industry of grave alarms designed to alert family and friends visiting gravesites of premature burials. Despite this semi-lucrative trade, there was never an officially recorded instance where a grave alarm alerted to a premature burial and saved a life. Despite the advances in modern medicine negating the actual need for a wake, the tradition continues as a forum for the community to express condolences and friends to affirm the decedent has passed—an important step in the grieving process. Prayer Cards: Funeral/mourning gifts were a common custom in Colonial-era America and beyond. Common gifts given to the mourners who attended were gloves, scarves, rings, and spoons. The rings bore inscriptions typical to the time period (e.g. “Prepare for Death”) and were often handed from one generation to the next as family heirlooms. 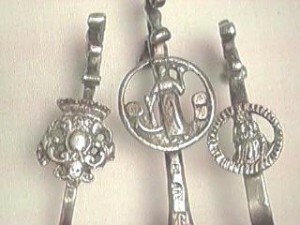 The spoons were called “monkey spoons” because of the curved hook on the handle end, and were often custom made for the event with funerary imagery or saints engraved in them. The value of the gift corresponded to the deceased’s station in the community, the wealthier the person, the more extravagant the gift. The gift giving caused the cost of the funerals to soar, leaving some municipalities to issue limits, or do aw ay with, the giving of gifts (except the pallbearers and clergy, they were still allowed to receive mourning gloves). But the tradition continues. Instead of a solid silver spoon, attendees of a funeral oftentimes leave with a prayer card or memorial folder as a keepsake of the event. Stones on a Headstone: Have you ever been in a cemetery and seen small stones placed on the top of a monument (monument or marker are fancy undertaker synonyms for headstone)? There are many interpretations of this ancient Jewish custom including marking the grave to prevent priests from becoming ritually impure to creating a bond with the deceased. And while those reasons aren’t incorrect, there’s a more practical reason. Centuries ago when Jewish people were buried in the desert mourners would mound collected stones over the grave because there weren’t modern stone slabs to serve as monuments. That pile of stones was the remembrance, the “marker,” of that loved one. The custom became, when family and friends would pass the grave, they would add to the monument to keep the person’s memory alive. If they didn’t continually build the stone mound the desert winds would eventually cover the monument. This tradition continues today when visiting family and friends place small stones on top of existing monuments when they visit. 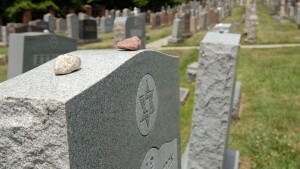 The practice has been extended beyond the Jewish faith, and visitors will often see these mounded stones in cemeteries of many different faiths today.